Enable all the application cache options in the Magento administration panel, under the “System -> Cache Management” menu. Cleaning a cache type deletes all items from enabled Magento cache types only. In other words, this option does not affect other processes or applications because it only cleans the cache used by Magento. Disabled cache types are not cleaned. Flushing a cache type purges the cache storage, which might affect other processes applications that are using the same storage. Flush cache types if you’ve already tried cleaning the cache and you still have unresolved issues. 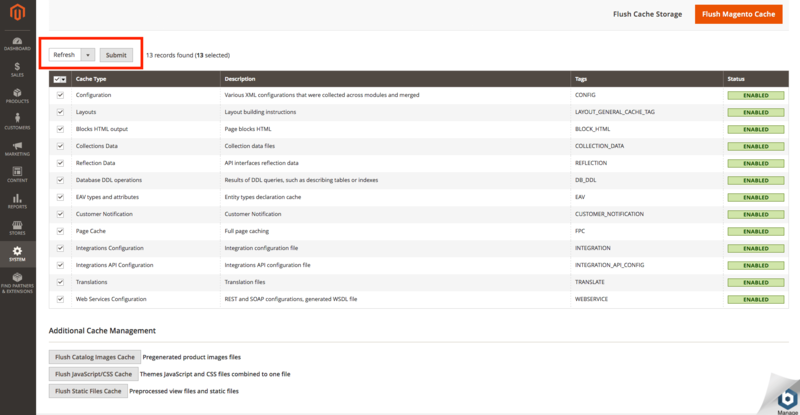 Open the Administration panel and click on “System-> Tools-> Cache Management”. Select all cache types and “Refresh” action in the drop down box located on the top left margin. Click both buttons “Flush Magento Cache” and “Flush Cache Storage”. TIP: This is recommended only if templates or source files are being changed. Go to “System -> Tools -> Cache Management”, mark all cache types and select “Disable” in the action box. Click the “Submit” button.